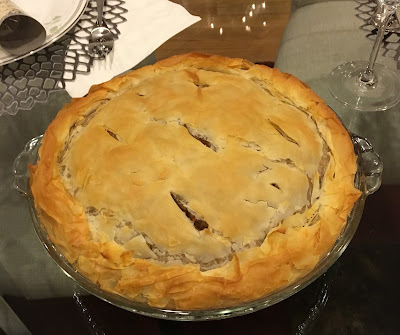 Longtime readers of this blog might remember my fast and easy puff pastry recipe. I have a confession: I've only made it a couple times since I published that recipe. It's faster and easier than most puff pastry, but it's still not that fast. Instead, if I find a recipe that calls for puff pastry, I often cheat and buy vegan crescent roll dough, then pinch the seams together. It doesn't have quite the rise of puff pastry, but it's a lot easier than making it myself... and the two companies whose crescent rolls I use are Annie's and Immaculate Baking Company, both of which have much better ingredients than the vegan puff pastry I could otherwise find. I don't actually like crescent rolls, is the funny thing. But the dough is so versatile as cheater puff pastry! Just last week I used a tube to make this Tofu en croûte, inspired by a French salmon dish but much kinder to animals. This dish looks really fancy and complicated, but is very simple and comes together quickly. It's also filling! I'm still breastfeeding so I eat a lot, and a 1-inch slice was a big enough serving. If you're looking for sides, this dish works well with a side of roasted squash, potatoes, or sweet potatoes in my case. I could also see this being great with asparagus or green beans. The Dill and Lemon Sauce (which follows the recipe) is optional but tasty. Cut the tofu through the middle horizontally to make two layers. Coat all sides of the tofu with mustard, and let it sit for a bit to absorb some of the flavor. In the meantime, put a medium-sized frying pan over medium heat. Add the olive oil and the greens, stir to coat, then sprinkle over the balsamic vinegar, if using. Cook until fully wilted (but not brown), 5-10 minutes depending on the green. The vinegar should have evaporated; if it hasn't, drain the greens as much as you can; we don't want extra liquid in this recipe! Lay out your puff pastry on a parchment-lined baking sheet. If you are using crescent dough, pinch the seams together so that you have a large square, or as close to a square as you can get. Place the first layer of mustard-coated tofu in the middle of the dough, then the wilted greens as a middle layer, and finally the top tofu layer. Cut into slices and serve! 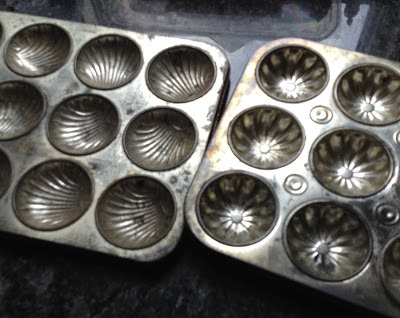 Leftovers will only keep for a day or two in the fridge before the pastry starts to get waterlogged. Stir all the ingredients together; taste to see if you want to add more lemon juice or dill to taste. (I used like a whole cup of fresh dill for the sauce above and it was delicious.) Let it sit for a little while to really let the dill flavor seep in. This is also really good on potatoes and/or as a salad dressing! Okay, so now that the recipes are over... want to see two other times I've used crescent roll dough in place of puff pastry? This first one is a vegan version of baked brie--it's the Kite Hill Soft Ripened (almond cheese) wrapped in dough, sprinkled with herbs. Kevin hates fruit in his entrees so I didn't spread jam on the inside like I wanted to, but I served it with cranberry sauce. 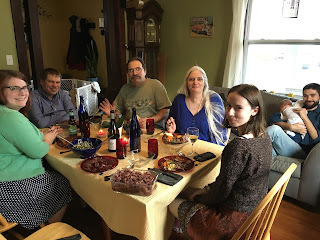 We each ate half (and a light salad) for a decadent dinner. Not picturesque but SO GOOD. Then this one is a little embarrassing but it was also delicious: a CHEESEBURGER RING. This is a real thing, you guys! But veganized. I cooked a bunch of Gimme Lean grounds with onions, parsley, Daiya cheese, and finely chopped pickles, wrapped it in dough, and topped with sesame seeds like a sesame-seed bun. This was really good warm but kind of gross cold out of the fridge the next day--the grounds and the cheese are both better warm than cold! I signed in to maybe write a new blog post and discovered a partial draft from AUGUST, oops. So while it's totally off season to post about a chilled soup, it's also cold and snowy here right now and I like remembering that it was once too hot rather than too wintery. It was above 90 degrees several days in a row this summer and we don't have air conditioning, so the baby and I mostly sat in front of fans on those days, and when it came time for dinner I wanted something cool. 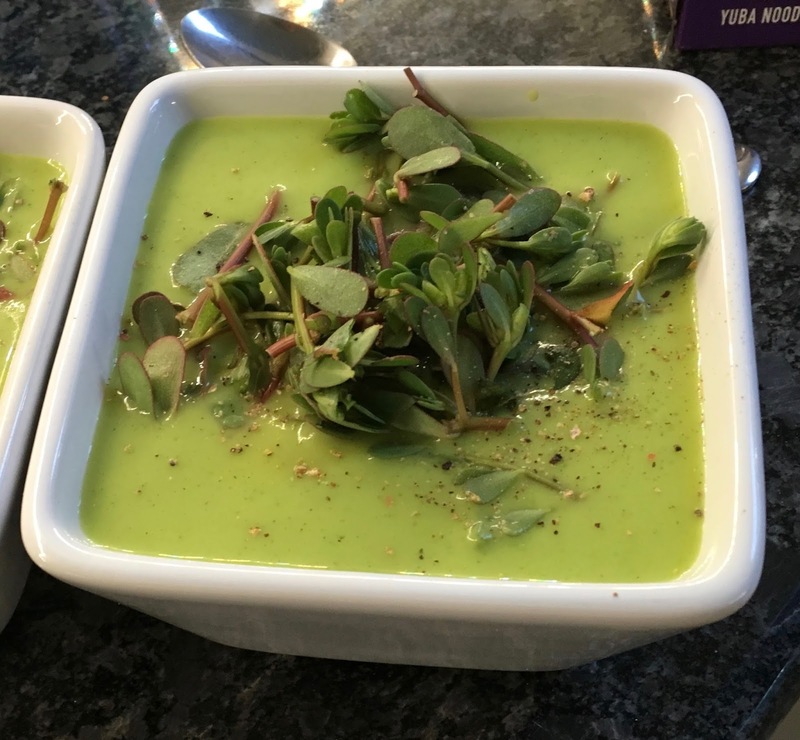 This Chilled Zucchini Soup from Food and Wine was perfect on those days. We had it with pita bread and these sesame yuba noodles (so much protein!). It does require heat, but that part is short and totally worth it for the flavor it adds, even on a disgustingly hot day. And if you don't have purslane or arugula, don't fret--the greens are just a garnish. I did have purslane (it grows as a weed around here and overtook two of my pots of dill in the garden), but next time I make this soup I'm just going to have it (or a different green) on the side. 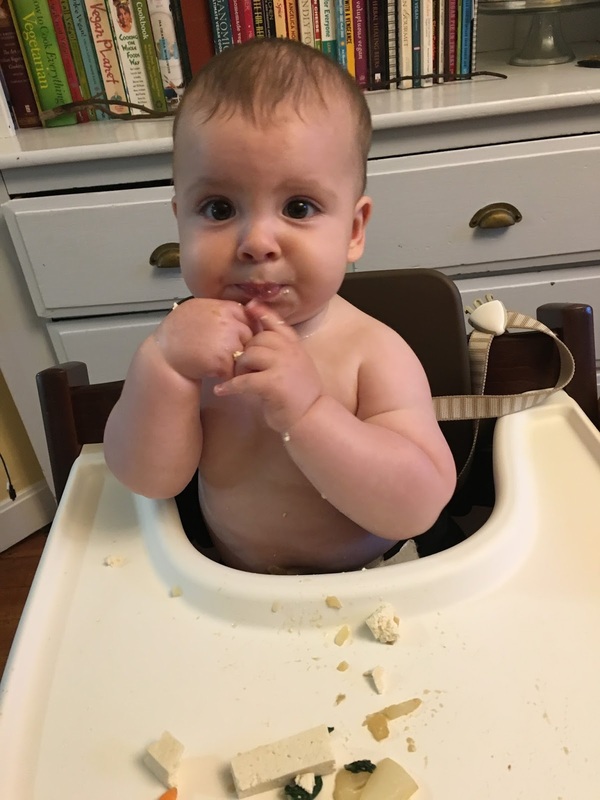 Side note: the baby LOVED this soup! Just as I thought I could get away with more posts here, Ezra outgrew the sleepy newborn stage and went right into teething, which is why there hasn't been much going on around here. But I've been cooking! I felt stuck in a "throw together anything I can" rut for a while this spring, so I started checking out some cookbooks from our local library. The Great Vegan Protein Book was a nice discovery. I've made three recipes from there and bookmarked a few more. The Tempeh Noodle Soup was delicious, and (in a good way) tasted like something you'd buy in a can. I didn't get any pictures but it didn't look as good as it tasted anyway. I have a weird thing about soup where I DO NOT like soup as leftovers, but this was a rare exception: it tasted even better the next day. 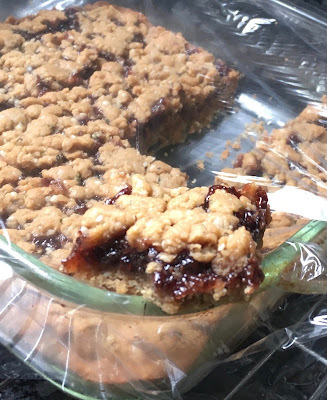 The Sesame Berry Bars were my favorite find and are definitely something I'd make again. They don't actually pack a ton of protein per serving but are full of great ingredients: hemp seeds, whole wheat flour, maple syrup instead of sugar, chia seeds, and any jam you'd like (so you can go for an all-fruit one). They also look and taste deceptively less healthy than they are. 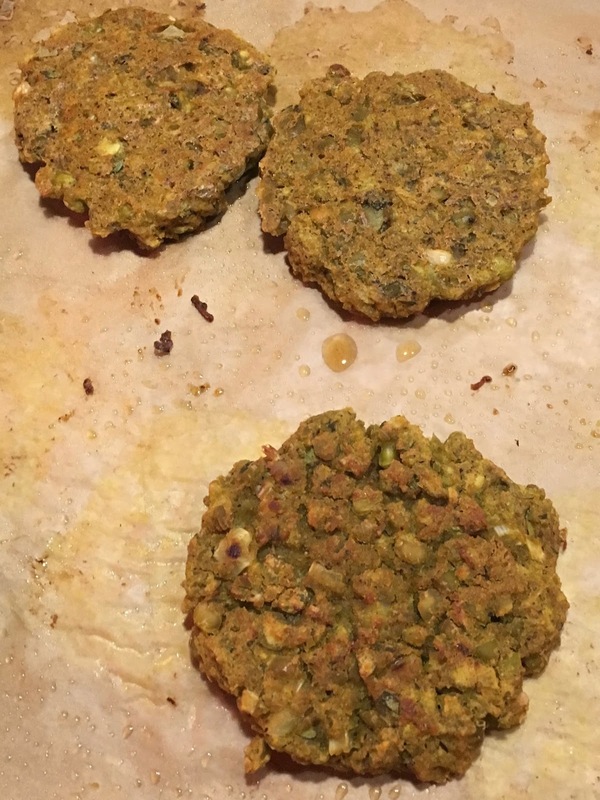 Finally, the Split Pea Patties, while not particularly photogenic, were a nice new way to use split peas. Seasoned with Indian spices, they came together easily and held together very well. I had worried my batter was too liquidy, but no, they turned out fine! Each recipe in the book tells you how much protein per serving you're getting, which seems useful. If you can't eat nightshades, like me, many of the entree recipes are out: they frequently call for sundried tomatoes or entire cans of tomatoes, which are too much to replace. Because of this, I got it from the library rather than bought it, but the recipes I tried were great. I still want to try the Almond Butter Biscuits and a couple other recipes from this book. Normally my family uses tofu turkeys for their holiday entree, which are simple: you just take them out of the box and bake them. If you haven't tried tofu turkeys, they're simple marinated/seasoned tofu shaped like a happy turkey. They're gluten free and come with an easy-to-make gravy. And they're just so cute! However, my sister-in-law is sensitive to soy, and I wanted something we could all have. 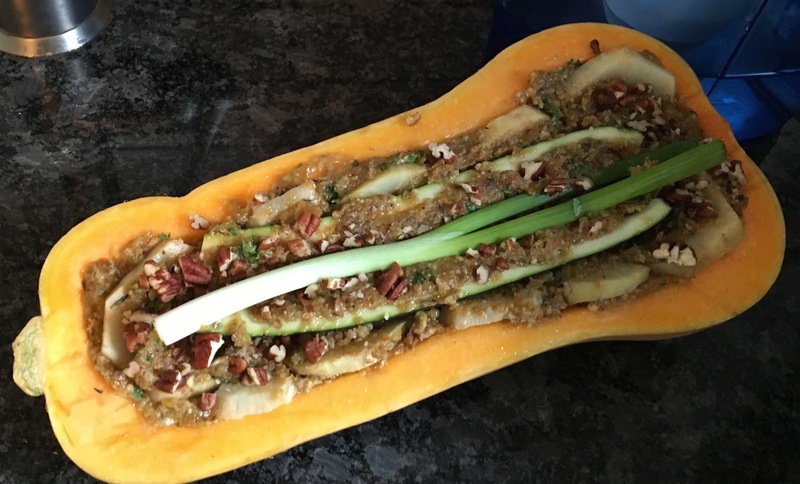 Many vegan entree options have gluten, but half the people at our meal were gluten-free, so I was pretty much left with one option: THE VEGDUCKEN. This recipe (and similar ones) was circulating around the internet for a while, just calling to be veganized. First, I have to tell you, this recipe is good, but poorly written. Or, at least, poorly organized--the list of ingredients isn't in any particular order. I ended up rewriting the whole thing in a Word doc just to make it make more sense. Here's what I changed: I used vegan butter (homemade, but Earth Balance would work) and halved the butter for the layering/sauce, and never used any mint. This turned out just fine, and we had plenty. 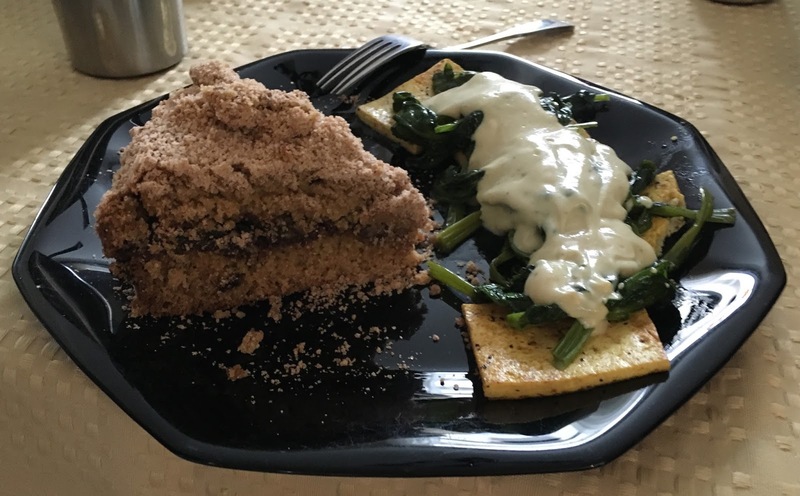 I used two flax "eggs" (2 Tbsp flax meal mixed with 6 Tbsp water) to replace the eggs, and to replace the parmesan cheese, I just used 2-3 Tbsp light miso. (Because of the miso, this means the recipe wasn't completely soy free, but you could use a soy-free vegan cheese like Daiya to make it so.) I used gluten-free breadcrumbs--the Hannaford store brand is just corn, sugar, and salt. Oh and my mushrooms were reconstituted dried. Finally, because I am allergic to nightshades, I replaced the eggplant layer with lightly steamed sliced celery root. And here's the thing: even with all these (in some cases rather dramatic) substitutions, it tasted great. And went together really easily. And here it is, baked and with some slices taken off. 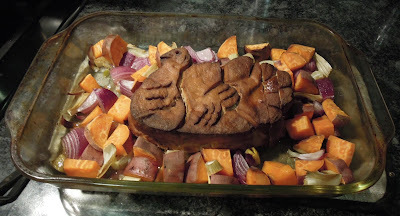 I recommend carving it at the table and serving it one piece at a time; when we tried to cut several slices in advance they fell apart and were not as pretty to serve. It serves a lot! I actually made two because there were 11 of us eating and my family are big eaters, but we never ended up finishing the first, let alone cutting into the second. And everyone really liked it! We hosted Thanksgiving so we wouldn't have to travel with the baby, but our dining room is small so half of us ate in the dining room and half of us ate in the makeshift second dining room (the living room). My side of the family! My brother is holding the baby in the back. Christmas dinner was a much smaller affair, with just us and Kevin's mother, so we cooked the meal together. Our entree was Elizavegan's vegan tourtiere, made with sweet potatoes instead of white potatoes, and phyllo dough instead of pastry crust--which was a delicious substitution! The crisp of the phyllo went well with the sweet potato and made up for the lack of starch the white potatoes would have provided. For Christmas dessert, I wanted to make something special. 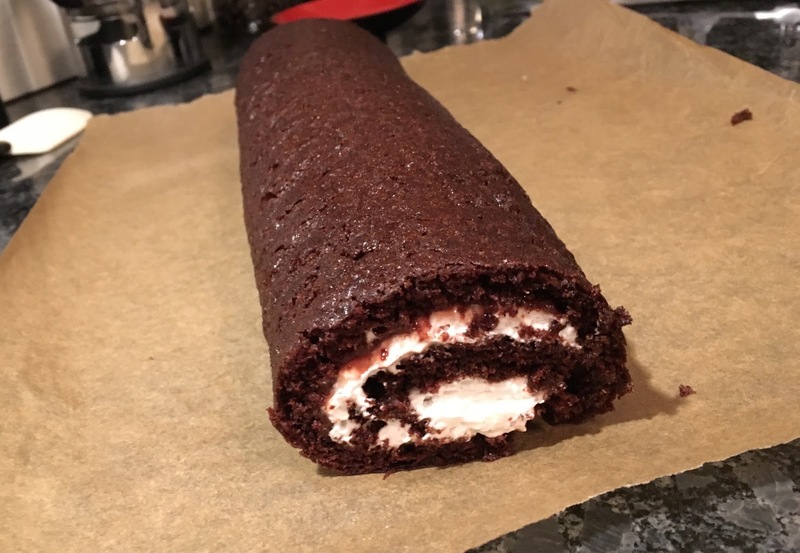 Inspired by The Great British Baking Show, which I watched in less than two days during my first week home with the baby, I decided to try my hand at a Swiss roll (also known as a jelly roll). And it went GREAT! The cake is the chocolate cupcake recipe from Vegan Cupcakes Take Over the World, spread out on a baking sheet and baked for only 10-15 minutes. I cooled it just enough to handle, then rolled it in a tea towel and let it cool completely. 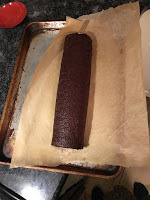 After that I unrolled it, spread it with strawberry jam and Coco Whip (I didn't have time to make frosting), rolled it back up and decorated it. It was huuuuge, so I only used half of it to decorate and serve (halved, with edges trimmed off for neatness, it served 5 people). I couldn't believe how simple and yet elegant it was! 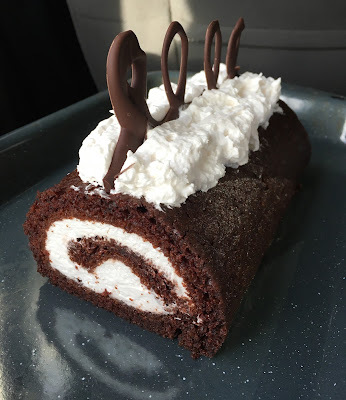 I'll definitely make Swiss rolls in the future, hopefully with yellow cake that I can decorate with batter like they do on the show. 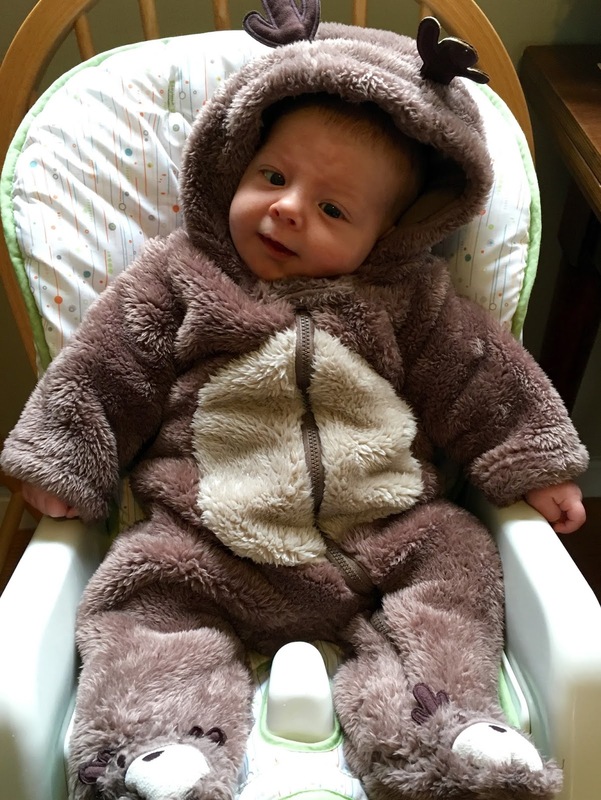 I also dressed my baby as a reindeer. Finally, New Year's brunch is a big meal in my parents' house, with loads of food and plenty of relatives to eat it all. With a baby in the house we were lucky to make it till midnight, and were not up for making a huge brunch the next morning, but we did something a little special: Kevin made a delicious fruit and nut coffee cake (from Angelica Kitchen) and I made tofu florentine with a hollandaise sauce from Vegan Diner. I usually make the one from Vegan Brunch, but I don't find it too flavorful. The Vegan Diner one has a lot of flavor, but I think the wine comes through a little too strong. Still a delicious New Year's brunch! Now the holidays are over, we're back to simpler meals... more on those later! vegan doughnuts and a baby! A baby! His name is Ezra and he is exactly one month old today. 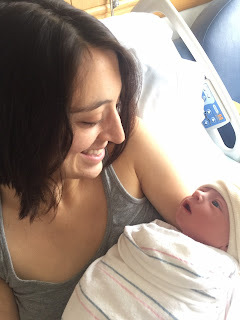 My work schedule leading up to the end of pregnancy picked up more than I thought it would, so blogging didn't really happen much during my pregnancy, but it was an easy pregnancy overall. We've had no problems or pushback regarding our veganism from any of our healthcare professionals. And this baby is awesome! 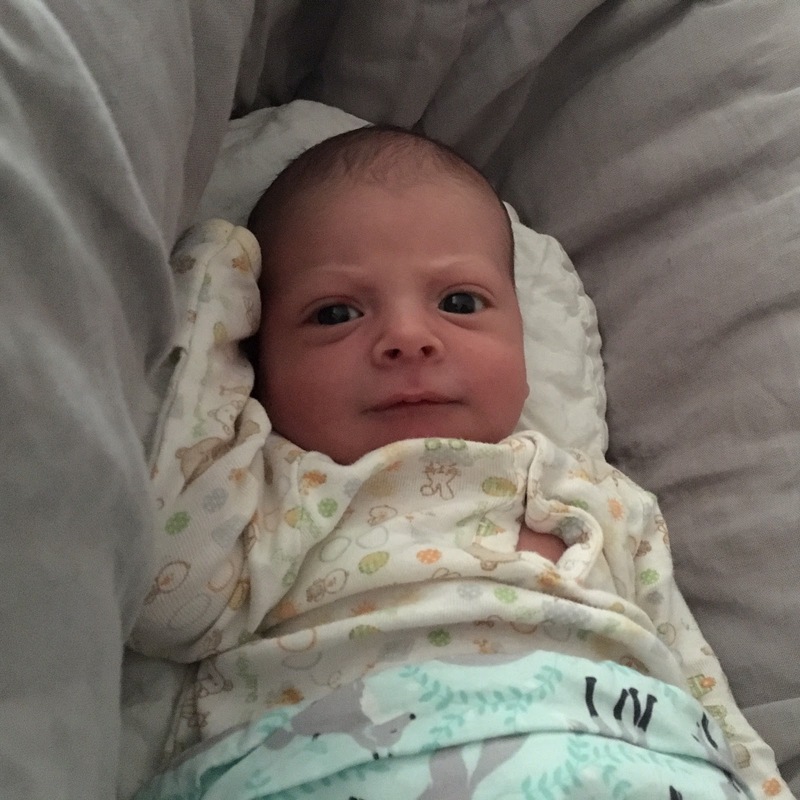 I am ambitiously hoping I will actually update more often now that I have a baby, in part because we spend a lot of time sitting down to nurse and/or nap, but also because I am done working! While I loved my job (teaching English at BFIT, a local college), I've always known that I wanted to be a stay-at-home mother, and (with years of saving and planning, mind you) I am able to realize that dream! But let's talk about doughnuts. 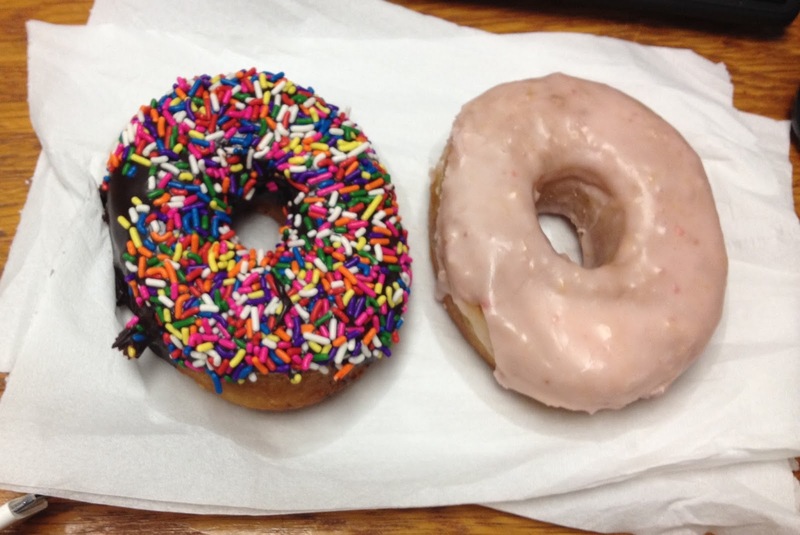 I love doughnuts! Growing up in Cooperstown NY, my favorite doughnuts were from Schneider's bakery. They make old fashioned doughnuts there: they're cake doughnuts, but still fried (as they should be) and have a dense inside with a crispy, barely sweet outside. You can get them glazed but then you don't get the same crispy outside. To me, these will always be the world's most perfect doughnuts. But they're not vegan. 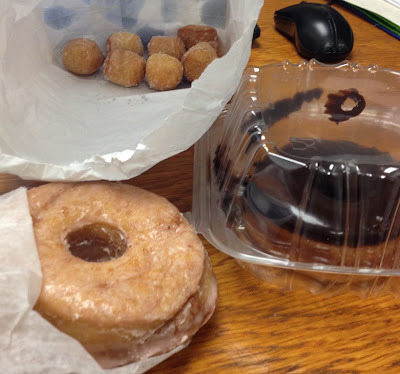 It has, until recent years, been really hard to find vegan doughnuts... especially if you can't have potato starch (which is in most powdered egg replacers and is used in many vegan doughnuts, like DunWell doughnuts in NYC). I've been hoarding doughnut recipes to veganize for when I have the time and ambition to deep fry. 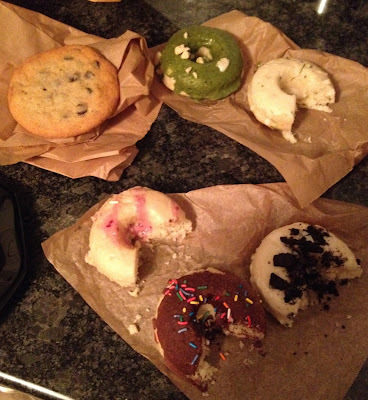 But in the last year or so, Boston has kicked up its vegan doughnut scene! For those who like cake doughnuts, Sabertooth Vegan Bakery, which operates out of Taco Party's (also vegan and delicious) restaurant location, has a staggering number of options. The flavor combinations are always on point--tasty and interesting: Matcha and Macadamia, Peanut Butter and Jelly, Cookies and Cream, etc. There are often at least a couple gluten-free (and I think soy free?) varieties as well. The doughnuts are better than the picture quality would suggest. For me, there are a few down sides. First, they're baked, not fried. Which yes, is healthier, but I like traditional (fried) doughnuts. Second--this is minor--the base is the same to every doughnut. The flavors are all in the icing. It's a good, simple base, but if you get a sampling (like we did above) it is easy to get tired of it, Finally, for my taste, they're too sweet. The base is sweet, and the icing is almost entirely sugar. But I think most people go for that sort of thing when they want dessert anyway! If I can't have vegan old fashioned doughnuts, I'll still happily eat yeasted (i.e., the Dunkin/Krispy Kreme type) doughnuts. Union Square Donuts has the best in town. They used to only have vegan doughnuts on weekends, but now you can get them any day of the week. There are usually two kinds: cinnamon sugar and a seasonal flavor. Above, a coworker happened to hit the on a day when there were two seasonal flavors. They also have vegan doughnut holes!!! I hadn't realized I missed these until I was able to eat them again. Obviously Union Square Donuts' doughnuts are heavy (because they are fried), but other than that, I have no complaints. They are delicious! I don't have pictures, but Veggie Galaxy also has vegan doughnuts on Saturday (possibly also Sundays soon). They're the yeasted kind, with basic or chocolate icing. They sometimes do jelly-filled, too! Have any of you tried making your own doughnuts at home? How did it go? 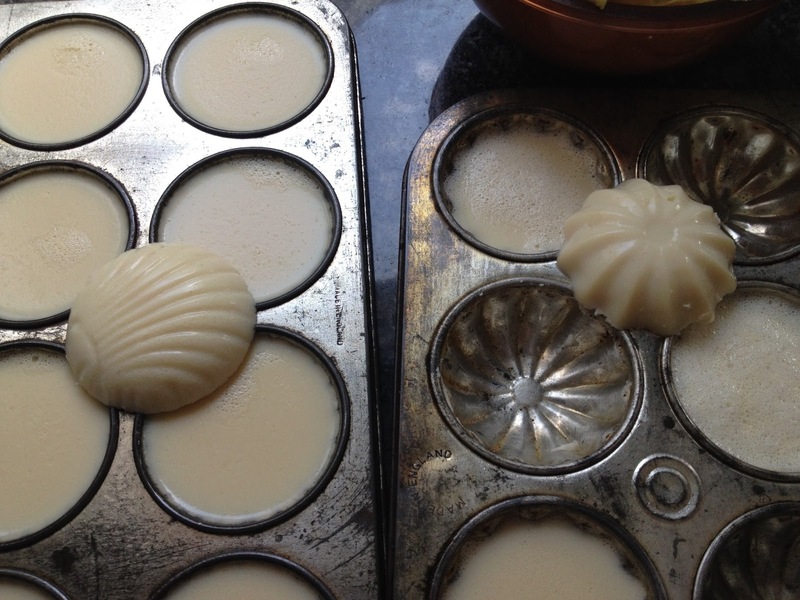 What recipe(s) did you use? We'll get to the deviled eggs in a moment, but first a small announcement: I'm pregnant! I'm at 17 weeks (4 months). I am, of course, vegan, and my doctors are totally fine with every aspect of my pregnancy. 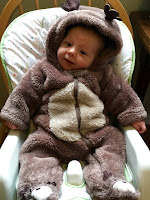 There have been many great vegan bloggers who openly blogged about their pregnancies well, so I am not interested in doing that myself at the moment, but I am happy to answer any questions people have. The biggest change for me since being pregnant is how much more often I get hungry! I fill up easier, which means my meals are often smaller, but my body still needs more calories per day, which means I'm snacking about every hour or two. Women should up their protein intake during pregnancy, so I try to make sure that at least some of my frequent snacks are protein-rich. But after 4 months, all my usual snacks are starting to bore me. 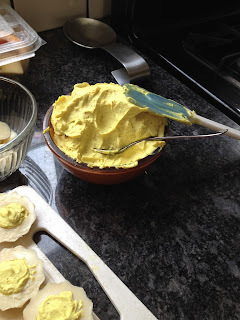 So when I found Lagusta's Luscious recipe for vegan deviled eggs, I had to try them! 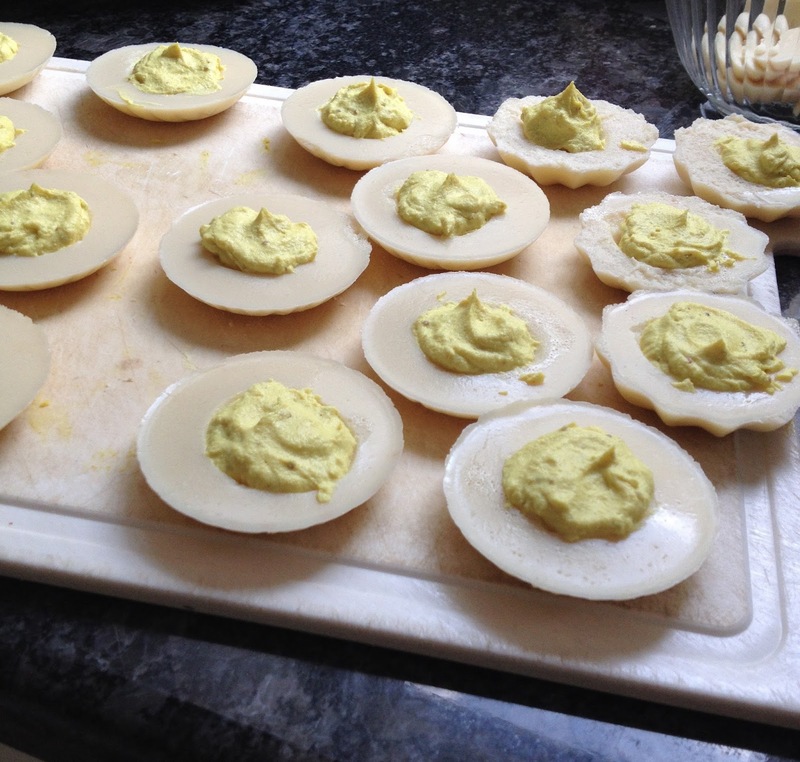 I had all the ingredients on hand, but I do not have egg-shaped molds. I have these though! And I don't mind if my "eggs" are shell or dome shaped. The "egg white" recipe calls for soy milk, though Lagusta and the comments on the blog entry all say that almond milk makes for a firmer and whiter white. I went with soy to make sure the eggs were higher in protein, but I did notice a little of the graininess she mentions. They hold up well, but next time I might use a little more agar (2.5 tsps?) to make them even firmer. And then I filled them! Before you judge how they look, remember that my eggs are upside-down shells. 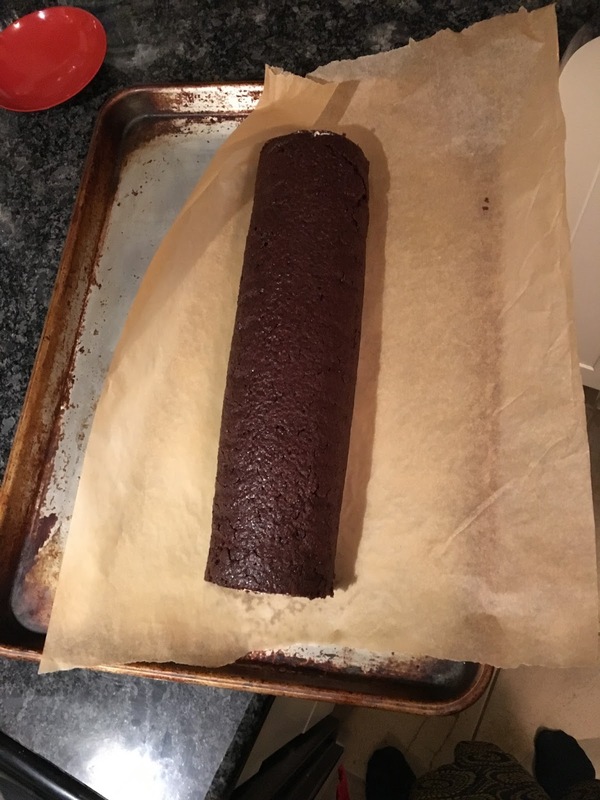 I also spooned in the filling instead of piping it in because I am lazy. The filling is pretty good, but it is WAY TOO SALTY for me. My mother's deviled eggs always had a lot of mayo, so I did up the amount of vegenaise, which could contribute to the over saltiness, but when I make this next I'm going to skip the whole 1 1/4 tsp salt and just salt to taste after all the other ingredients are in. It's okay in combination with the whites since the whites are a little bland, but the whole deviled egg is still a little saltier than I'd like. And holy cow, look how much filling is left! I mixed some of it with the scooped-out parts of the whites for an egg salad that I'll have on bread for lunch. Lagusta says that it makes a good dip, but like I said, it is WAY too salty on its own, so I'll probably blend in some cashews before I can use it straight. 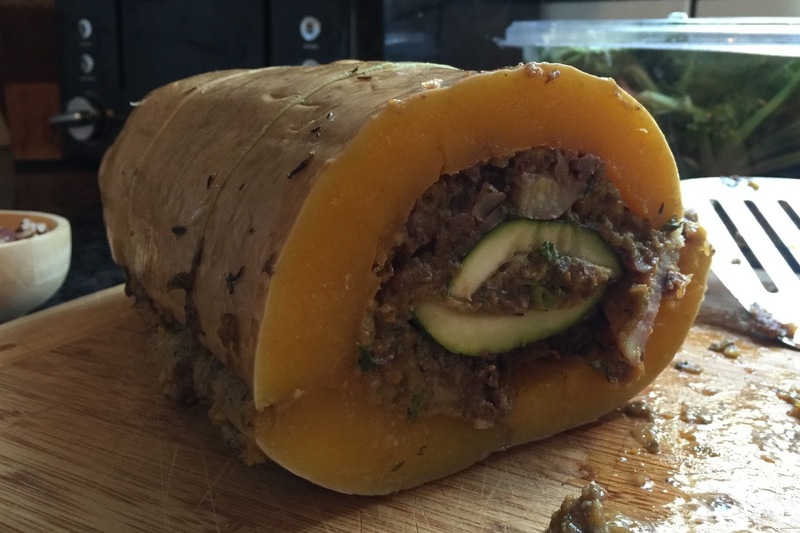 Despite the saltiness, I liked this recipe a lot, and will definitely make it again! For some reason, rather than deciding Uzbek cuisine was not my thing, all this started me on a quest to try to make some vegan Uzbek food at home. Vegan Tashkent salad, "roasted" garlic (I'll explain later), and Plov! Serves 3-4, depending on how hungry you are! From there I followed the directions from the original recipe: add the rice, stir to mix it all together, then add the water, lower the heat, and cover. And here's the coolest part, the "roasted" garlic. In the last 10-15 minutes of cooking (so if you're using white rice, pretty much as soon as you cover it--if you're using brown rice, after about 15-20 minutes), you put an entire head of garlic right in the center of the pilaf, so it steams and gets soft and creamy on the inside--just like roasted garlic from the oven, but less messy and in way less time! I could not believe how cool this was, and have done it with other dishes now. There it is! Hidden in the center of the plov! At the time I was really worried about the garlic burning or sloughing off its skin into the rice, but it all worked out just fine. The tashkent salad (or is it supposed to be salad tashkent? I do not speak Uzbek so I have no idea) was a veganized version of this recipe from Tasty Arbuz. Tashkent salad is basically a creamy slaw made of radishes and tongue, which, you know, super not vegan. (Have any of you read Hugo Hamilton's memoir The Speckled People? There is a tongue-as-food-related scene in it that is incredibly well written... and it describes how gross the whole family found it. If I were still doing my "food from books" series, this would be such a good one!) But I had some leftover baked tofu from a previous dinner, which, thinly sliced, was a perfect tongue substitute. And I used vegenaise instead of mayo, and everything was fine! Verdict: I would definitely make plov again, and am so excited about this "roasted" garlic technique. As for the tashkent salad, it was fine, but essentially a radish slaw, for which I don't really need a specific recipe in the future. Have you ever had Uzbek food? Is there any dish from that buzzfeed list you'd like to make/veganize? Keep me posted!